The one thing that was conspicuously absent from all of the hundreds and hundreds of photos that April & I took were pictures of food. And I’m not sure why…I feel like it had something to do with us being unsure if we would be offending anyone by whipping out our camera at each meal. When I thought about what food (other than raw sea urchins) I should write about, I realized I should definitely talk about olives and hazelnuts. And as I was about to write this post, realized I had already a quick blurb about olives, so I decided I would cheat save time and just reblog. Plus I have a LOT more followers now than I did almost a year ago when this first posted and this saves you from having to scroll so far back. 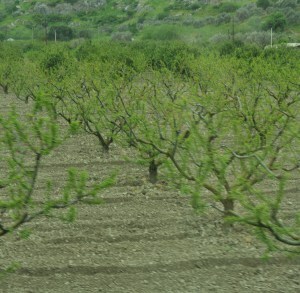 In regards to hazelnuts, Turkey grows nearly 75% of the world’s supply of hazelnuts. And they are everywhere, mainly roasted for sale in the markets and in a chocolatey spread (think Nutella, but much more flavorful). Of course once I had tried this amazing deliciousness, I indulged every morning for breakfast! I even tried to bring some back. I COMPLETELY ignored April’s advice to pack it in my checked bags because those bags were already filled with bottles of Turkish olive oil. And I thought because it’s a solid, I could carry it on. The kicker? It wasn’t until our 8th (and final) checkpoint in Istanbul that it was confiscated. NOT HAPPY. NOT HAPPY AT ALL. Even after all this time. I mean, c’mon–it’s food and it’s me, so you know it’s serious!